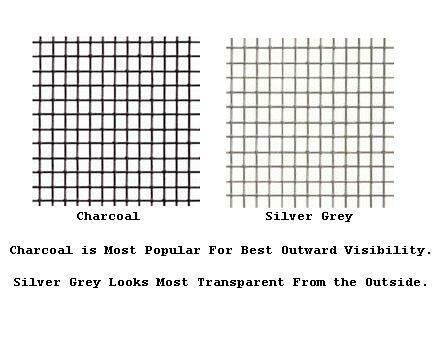 The fiberglass window screen roll is a great economical way to rescreen several insect screens around your home. You can turn the screen mesh either way you need to with no difference in appearance or function of the material. Most standard fiberglass meshes are very similar or even the same mesh count and diameter of yarn so this will probably match your screen mesh. You can also use this fiberglass screen meshing on outdoor enclosure like patios, porches, and gazebos. Sometimes when rescreening your old frames you can salvage the old spline if it is still pliable. If the old spline is hard and brittle you will need to replace the spline. The most common spline form most 1/8 of an inch wide screen frames is a .150 serrated spline. If it is an Anderson screen with the metal U shaped spline you will need to buy the .270 foam core spline will most likely work. It is available in two colors, charcoal and silver grey. 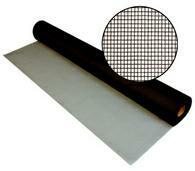 The screen mesh is easy to install in window screens. It's 18x16, .011 diameter. Color Charcoal Silver Grey Show Colors? I use your site for multiple orders and find the service efficient. NO issues with the quality of your products. Excellent value! Quick and easy. No fuss, no muss. Disadvantages: Took a few days, but that was not an issue. Phone contact was courteous, and very helpful. I am passing your info along to other people. Excellent service. Al D.
Advantages: Service was fast and prices were competitive. Received 15 custom sized screens for a new screened patio enclosure on 12/23/17. All screens were to 1/16th of an inch. Shipped in wood framed crate. Fair shipping cost considering they had to travel ~1500 mi. and not be damaged. Great customer service during planning. As always: MEASURE (at least) TWICE and CUT ONCE as they say. Your measurements are the key for the custom screens for both you and QSC. Advantages: Considering the size of my job, getting custom made screens was the best option over DIY options like flex screen and screen tight. The aluminum frame will last much longer for only about 25-30% more $. Ordered the heavier duty 1" frame option. I live in an area that frequently is below freezing. Plastic DIY competitors stuff did not seem like the best option for durability. Factor sun/heat exposure in durability also. Factoring the required labor for the DIY option, there is no doubt I will be happier with the long term investment here. Disadvantages: ONLY negative: Knowing when shipment was arriving. QSC did a great job. Great product. Arrived in tact & on time! Just wanted to let you know how satisfied I am with your products! The information you provide on how to measure properly and the process to place your order is simple and straightforward! I placed my order online and received my new screens in 5 business days! They were packaged extremely well and they all measured exactly as I specified and fit perfectly!! Excellent site, Excellent products and Excellent Customer Service!!! Awesome price and quick delivery, after hurricane Irma trying to buy screen from the local big box stores was impossible, thanks for being there when we really needed screen. Highly recommend to my friends. Very easy too assemble. The frame snaps together in seconds. They give all the material and tools to install the screen. 15 to 20 minutes and your ready to set it into the door track.